I first read about this toner on Kerry’s blog, and I immediately became curious about adding a mild AHA exfoliator to my skincare routine. But there were very few reviews out there on this particular AHA product, so I was a little nervous about trying it. In the end the minimalist ingredients won me over. And I’m so glad to have tried Silk Naturals 8% AHA Toner! I’ve been using this for a month, and overall I’m really satisfied with the results I’ve seen. 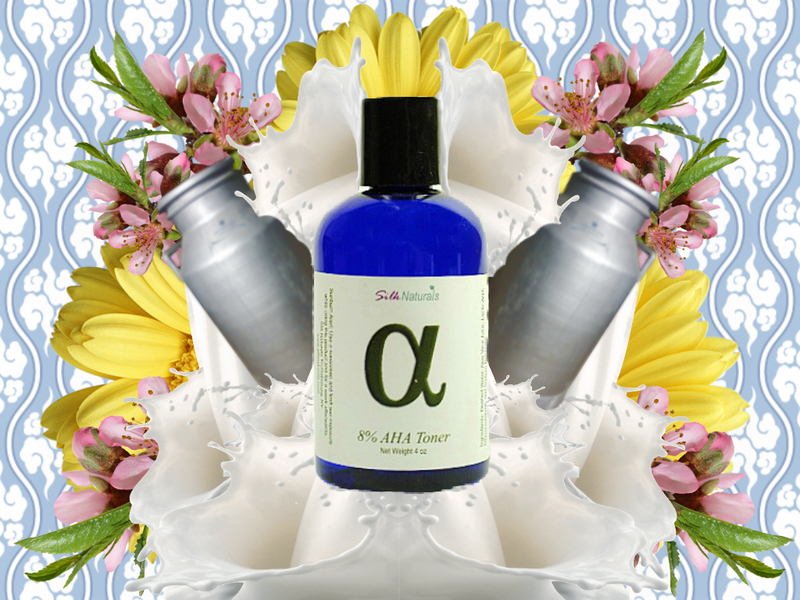 Silk Naturals is an independent skincare and cosmetics company from New York that focuses on using natural ingredients. As a wonderful bonus, they don’t test anything on animals. This is my first purchase from them. It retails for only $9 on their website, which is so amazingly cheap for a generous 4 oz bottle, and I found it to be a great way to experiment with an AHA exfoliator. Speaking of experimentation, I need to give out this warning before I continue: Please DO NOT use this in combination with a BHA exfoliator unless you think your skin can handle that much exfoliation. While I do like to experiment, I don’t go into it blindly. I do a lot of research and I think about how certain ingredients will do with my skin. I use a very mild BHA that’s suitable for sensitive skin, and because my skin seemed to do really well with low pH products, and it was already acclimated to the BHA, I decided to add a mild AHA to my routine. But I do not recommend this to everyone, so please proceed with caution. Ok, enough with disclaimers, let’s get to the review! As I said before, the minimalist ingredients were ultimately the reason why I decided to experiment with this AHA. There’s nothing in it to cause acne, and is also suitable for sensitive skin. Ingredients: Distilled Water, Aloe Vera juice, Lactic Acid, Gluconoactone and Sodium Benzoate, Sodium Bicarbonate. The AHA in this product is lactic acid, which is less irritating to the skin than other AHAs like glycolic acid. Also, this product is only 8% AHA, which is low enough to not cause irritation, but high enough to still make it effective as an exfoliator. Also, they added aloe vera juice to soothe sensitive skin. And best of all, this exfoliator has a final pH of 3.5, which is effective for exfoliation. Alpha Hydroxy Acids: aka AHAs, are potent exfoliators that help to increase the turnover rate of skin cells, and remove the top layers of skin. (Whereas BHAs work to exfoliate the pores and deeper levels of the skin.) Therefore, AHAs can make dull skin look brighter, and reduce fine lines. Silk Naturals recommends it for anyone with tired, dull looking skin. They’re also potent water binders, so they help to firm and hydrate the skin. Because of the skin-soothing ingredients, I thought that this would be a great compliment to my mild BHA exfoliator, and I was not wrong! I use this as a toner on dry skin right after I wash my face. It’s an almost clear liquid. The only bad thing is that it smells awful! Like spoiled milk and rotting grass. But I appreciate that they don’t add fragrance to mask the smell. I use my hands to put a few drops of this product all over my face (avoiding the eye area, of course). And I let it completely absorb into my skin before I follow up with my BHA the same way. I started out by using this only at night for the first two weeks, and then once my skin got used to it, I used this in the morning too. At night, I want to let the exfoliators really do their work, so I leave my skin alone for 20-30 minutes before I follow up with the rest of my skincare so that my skin remains at the optimum pH level for exfoliation. But in the morning, I’m a little rushed for time (and I want to give my skin a bit of rest) so I only leave it on for about 5 minutes before following up with the rest of my regimen. Exfoliators tend to make your skin a little worse through purging before it gets better. But I experienced no purging while I used this, probably because my BHA has already purged everything that needed to be gone! Even though I experienced no breakouts, I know that this toner is working well. For the first couple of weeks, I felt a tingling sensation on my skin when I first used this product. And about a week in, I noticed that I had a fine layer of dead, flaky skin. After I noticed my skin flaking off, I just made more of an effort to exfoliate my skin more regularly with my konjac sponge. (I’m avoiding harsh scrubbers or exfoliating beads, because they tend to really irritate my skin. No more micro-tears for me!) I do notice that I need to exfoliate with my konjac sponge every other day now, because otherwise my skin starts to feel almost leathery due to the dead skin cells. After I exfoliate, however, my skin feels amazingly smooth. After using this for a month, I do notice that my skin is brighter and less dry. Which is great for wintertime! And the only fine lines that I had between my eyebrows (from frowning into law books) have totally disappeared. In fact, when my skin is completely dry, I noticed that my forehead is so tight and smooth, that it looks completely photoshopped! I only wish I had the same results on my cheeks, but alas, my enlarged pores will never allow my skin to look photoshopped. And I have noticed, however, that this AHA seems to make my rosacea a little worse. But I’ve decided to use the rest of the bottle, and then decide later if I’ll keep using an AHA as part of my daily skincare regimen. I’m really happy to have discovered this product! It’s a mild yet effective exfoliator, and the price can’t be beat! Also, I love the fact that the ingredients are so minimal and soothing. However, it did seem to make my rosacea a little worse, but I’m hoping that’ll get better over time. But overall, I like this product so much that I’ll be purchasing their BHA toner when I’m done with my Paula’s Choice Skin Perfecting 2% BHA Liquid. Pros: Great ingredient list, effective pH level, great price, and works as it’s supposed to. Thanks for your question! I’ve actually decided to stop with the AHA and continue using only the BHA because my problem right now is more acne and rosacea than wrinkles. BHAs help to clear out the pore, so it’s good for acne. AHA’s exfoliate only the surface of the skin, so it’s better for wrinkles. The AHA didn’t seem to do much for me, so I decided to keep it simple with just the BHA. Hope you found a great and gentle AHA! Remember to not over-exfoliate!